Hours after the U.S. Women’s Gymnastics Team won the gold medal, Team USA’s other biggest stars swept their events as well. Katie Ledecky and Michael Phelps won their second gold medals of the Rio games, both under circumstances that made their victories even sweeter. Ledecky’s win on Tuesday in the 200-meter freestyle wasn’t as dramatic as Sunday’s 400-meter freestyle, in which she broke her own world record. However, as NPR notes, she is better at long-distance swims, and this was expected to be her weakest event in Rio. Nevertheless, she beat Sweden’s Sarah Sjöström by .35 seconds, with a time of one minute, 53.73 seconds. That keeps Ledecky on track to be the first woman to win three individual freestyle gold medals in one Olympics since 1968. Later Michael Phelps picked up his 20th gold medal, and perhaps more importantly, trounced Chad le Clos. Phelps has been feuding with le Clos since the South African beat him in the 200-meter butterfly — his signature race — by five-hundredths of a second at the 2012 games. And of course, there was this. Phelps finished in one minute, 53.36 seconds, and le Clos came in fourth. The win made Phelps, who is 31, the oldest Olympic swimmer to ever win an individual race. 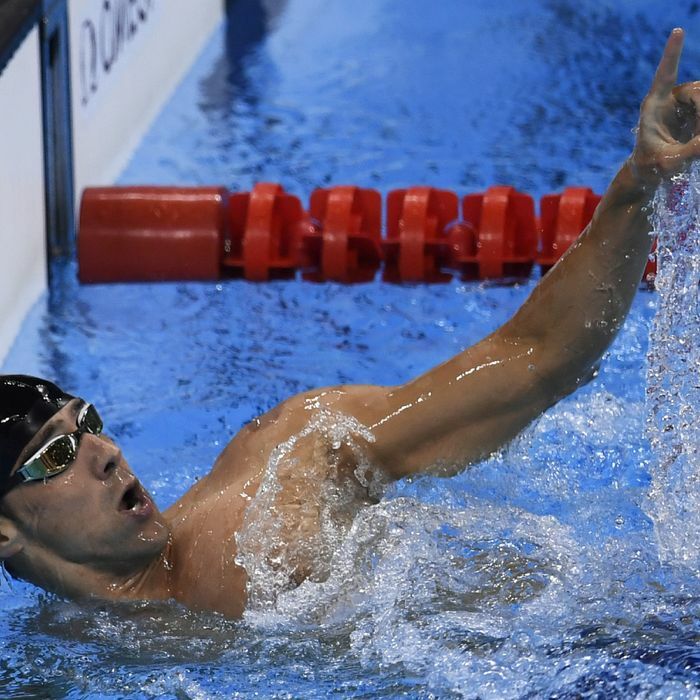 About 75 minutes later, Phelps won his 21st career gold as part of the men’s 4x200-meter freestyle-relay team. And he had ripped his cap moments before entering the water. In other words, these two American kids have done pretty well for themselves.